One of the best ways to get insight into a company's future is to take a look at what has happened in the past. TrueCar is a company that was designed to help people find the best possible prices on a variety of cars in the local area. As the company headed towards its first 100,000 customers, its future started to look very bright. Now that TrueCar has established a strong history, it can look forward to a prosperous future. A company never gets a second chance to make a first impression. You can tell a company is going to be successful when it starts to pick up momentum with new clients. The TrueCar website was first launched in 2008 and, by the end of 2011, it had helped over 350,000 car buyers make the right decisions. Between August 2011 and September 2011, the site helped over 20,000 people to buy a car. That is momentum that would explain why TrueCar raises $200M+ to help in its expansion. One of the more important aspects of a company's growth is offering services to its clients that make sense. For example, Honk.com is a website that helps car buyers communicate and exchange helpful information. 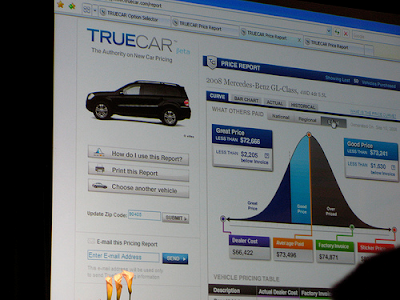 It is a natural fit with the TrueCar business model, which is why TrueCar acquired Honk.com. TrueCar also purchased the Automotive Lease Guide portion of the DealerTrack website. Once again, complementary businesses are smart acquisitions for growing companies. After four years in business, TrueCar is starting to make inroads with some important companies to help the organization grow. The $200M+ in funds that were raised comes from a list of financial companies that would make any company look successful. Capital providers such as USAA, GRP Partners and Silicon Valley Bank have all agreed to be part of the funding for TrueCar. In order to generate this kind of sustained interest, TrueCar must be doing something right. The consistent and staggering increase in web traffic that is utilizing the site shows that the word is getting around and the service being offered is considered solid. A company has to work on creating a strong history before it can look forward to a promising future. TrueCar has picked up a lot of professional momentum that has allowed it to attract some of the more significant venture capitalists in the industry. As the product gets better and the traffic increases, the future can only improve for TrueCar.